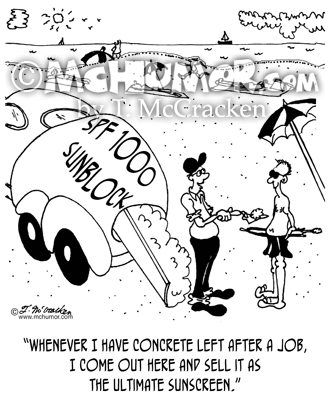 Masonry Cartoon 6763: A contractor at the beach selling wet concrete as "Sunscreen, SPF 1,000" saying, "Whenever I have concrete left after a job, I come out here and sell it as the ultimate sunscreen." 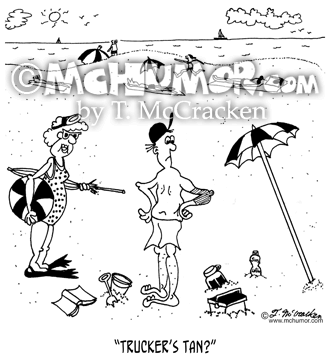 Truck Cartoon 7373: Of a man wearing a bathing suit where the only part of him tanned is the left side of his face and his left. "Trucker's tan?" 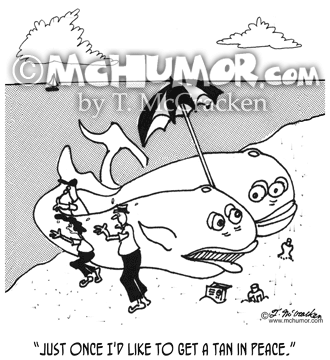 Whale Cartoon 3139: As people try to push a beached whale into the ocean he says, "Just once I'd like to get a tan in peace." 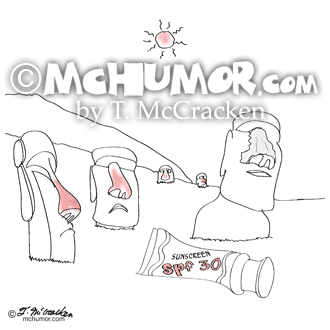 Sun Burn Cartoon 9354: A statue on Easter Island has white goop on his nose next to a huge tube of “Sunscreen SPF 30.” Other statues have sun burnt noses. 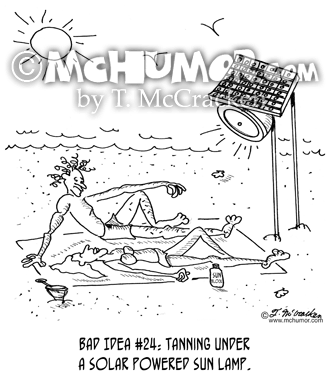 Solar Cartoon 1434: "Bad Idea #24: tanning under a solar powered sun lamp." A couple on a sunny beach lie under a lamp with solar cells. 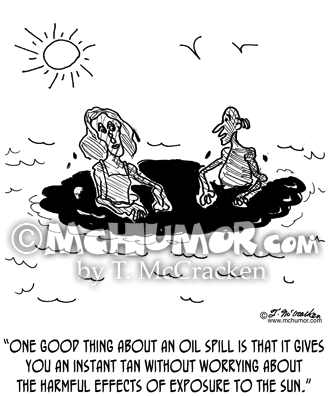 Environment Cartoon 1432: A swimmer says, "One good thing about an oil spill is that it gives you an instant tan without worrying about the harmful effects of exposure to the sun." 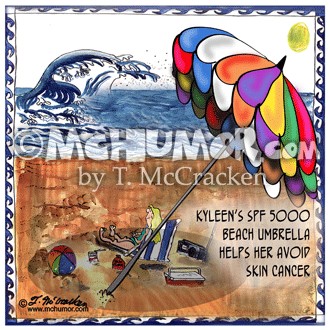 Umbrella Cartoon 8587: “Kyleen’s SPF 5000 Beach Umbrella helps her avoid skin cancer.” A woman at the beach sits under a humongous umbrella. 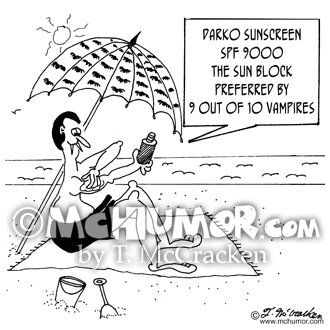 Beauty Cartoon 5866: A vendor at the beach selling "Darko Sunscreen, SPF 5000, the sun block preferred by 9 out of 10 vampires." 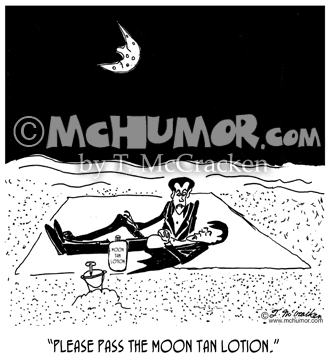 Vampire Cartoon 1289: A vampire lying on a towel on a beach at night says to another, “Please pass the Moon Tan lotion." 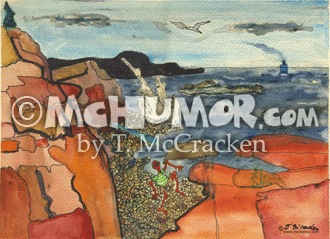 Beach Cartoon 9244: A watercolor painting of a very sunburnt beach comber.